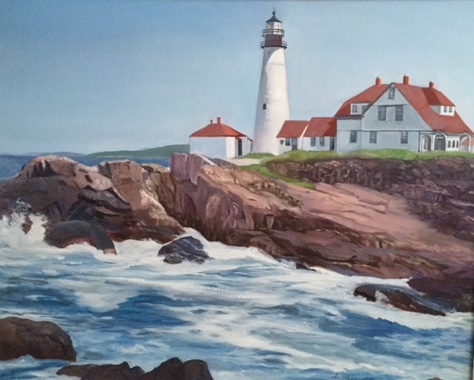 The artistic works of Dominican Sister of Hope, Sister Mary Ellen Wisner, OP will be on display at the Mariandale Retreat and Conference Center through September, 16, 2016. A Life in Colors features the mixed media work of this Dominican Sister of Hope who taught art for many years. In retirement she has been able to devote more time to her own work. S. Mary Ellen works in oils, water colors, and stained glass. Sister’s work is on display in the chapel at Mariandale and is open to the public Monday through Friday from 10 am to 4 pm. There will be a reception for the artist on Sunday, August 28, 2016 from 4 pm to 6 pm. Refreshments will be served. RSVP is required. The Mariandale Retreat and Conference Center is an ecumenical retreat center located an hour north of Manhattan in Ossining, New York on the Hudson River. Located at 299 North Highland Avenue – it is easily reached by train or by car. There is plenty of parking and it is handicap accessible. For more information about the Mariandale Center, facilities and programs visit www.mariandale.org or call 914-941-4455.